There's a big ferris wheel and rides, plus a Santa's grotto, but we were there to see the ice rink (which is huge, plus they have penguin shaped guides for children - and wobbly adults! 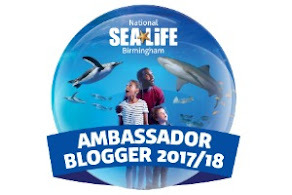 - to hire), the ice slide (three different ones to brave, right next to the edge of the dock) and the ice bar (where you wrap up like a turkey in tinfoil at Christmas!). The rink times are staggered so you get around 45 minutes on the ice and it means that whilst it's popular, it's not too busy. The ice slide tickets can be used at any time but do note that children over a certain height have to travel in a ring by themselves - unfortunately Ethan was too big to go with me and was a bit scared to do it alone, as the slide is pretty high. The rain had started to come down at this point too and we were due to go to the ice bar, so sadly we didn't go down the slide in the end but it did look like immense fun! 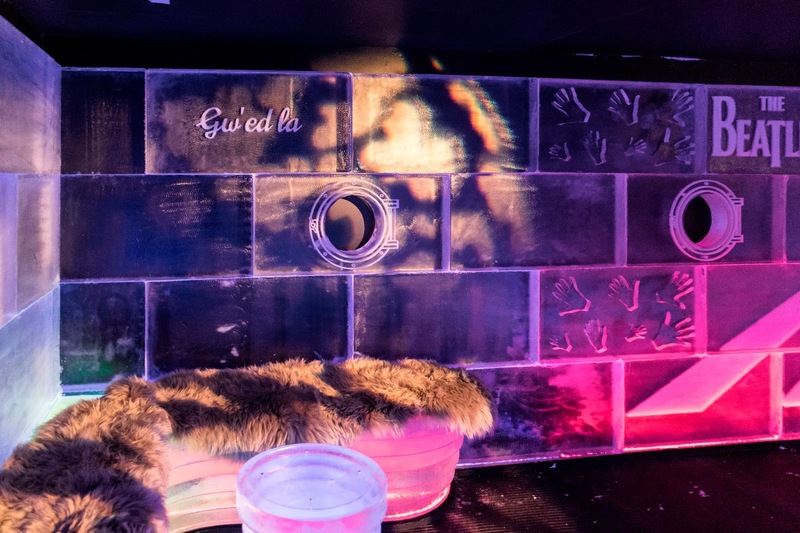 The ice bar was great (you get a drink served in an ice shot glass included with the price of your ticket) and there's various ice sculptures inside to look at. In Ethan's words, 'it was a little bit cold!'. 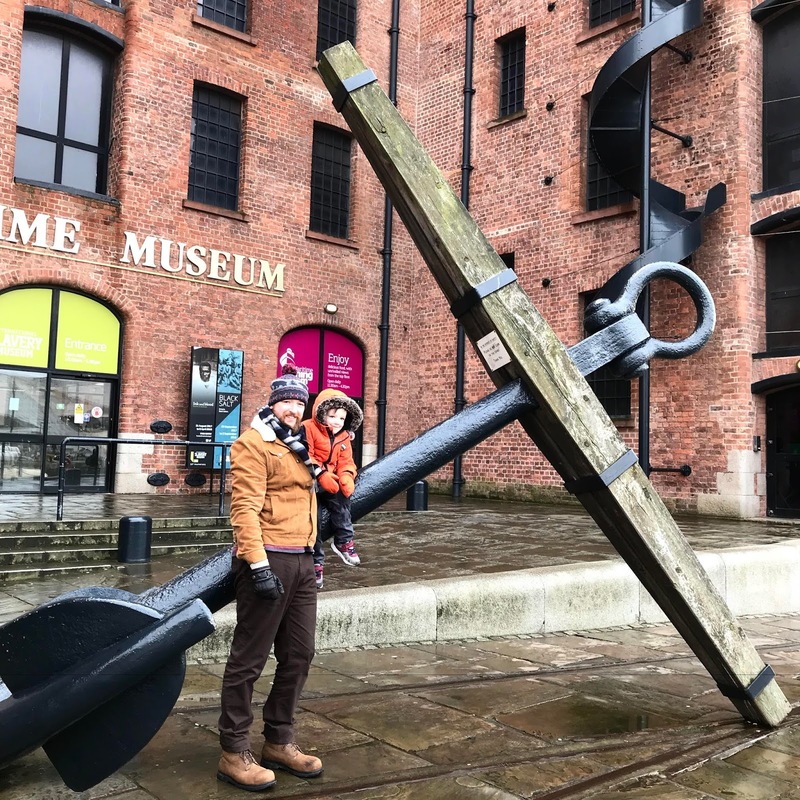 After enjoying the Ice Festival, we had a nice stroll over to Albert Dock. This is a real highlight of the city, full of bars, restaurants, gift shops, artists and The Beatles Story too. There's so much to take in, and to take photos of, and we really enjoyed walking around here. 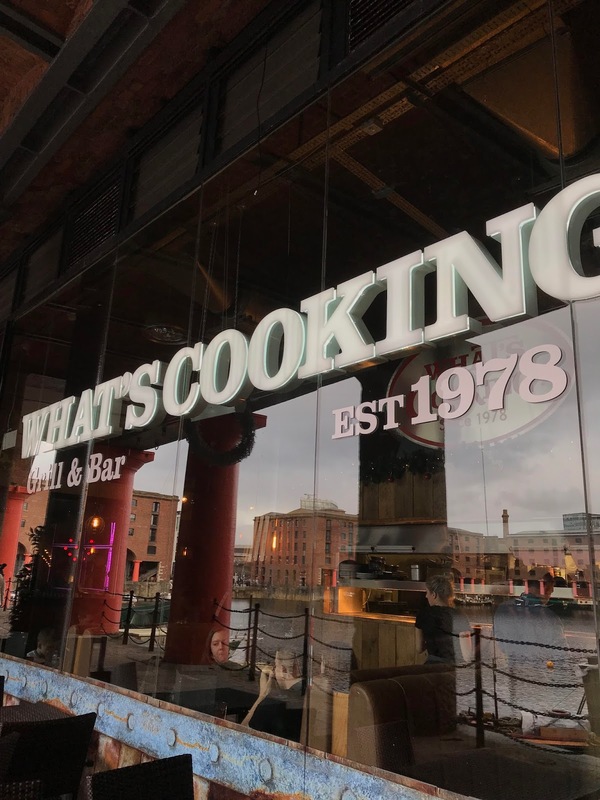 We were booked in for lunch at What's Cooking?, which is an Americana style burger and grill restaurant. We received a warm welcome and enjoyed a window booth seat where we watched the world pass by on the dock outside. Ethan wolfed down a hotdog and some pretty tasty fries, hubs did the same to a classic burger and I struggled to finish a Mexican burrito style chicken dish, there was just so much - but it hit the spot perfectly. The weather had cleared up by the time our plates were cleared away, and we headed out the other side of the restaurant to walk less than a minute to The Beatles Story museum. Ste is a big Beatles fan and this was a really unique museum to walk around, unlike anywhere else I have visited before. Audio headsets are given as standard and if you are really into your music, and you have the time, this is an informative way to get the very most out of your visit. 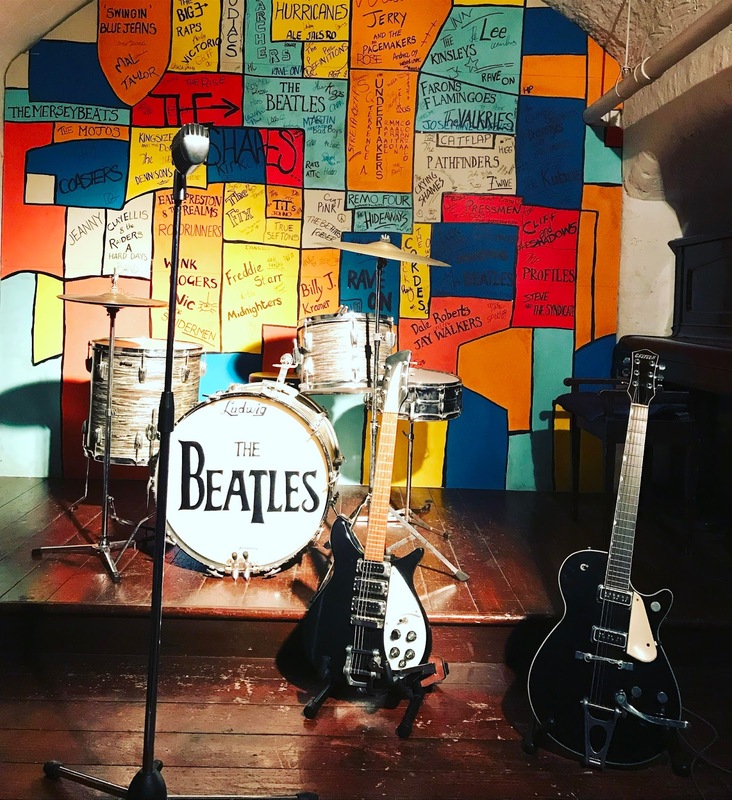 You follow the winding layout of the museum, walking through replica and themed sets - including a yellow submarine - whilst listening to music and stopping to take in memorabilia, costumes, guitars and displays. 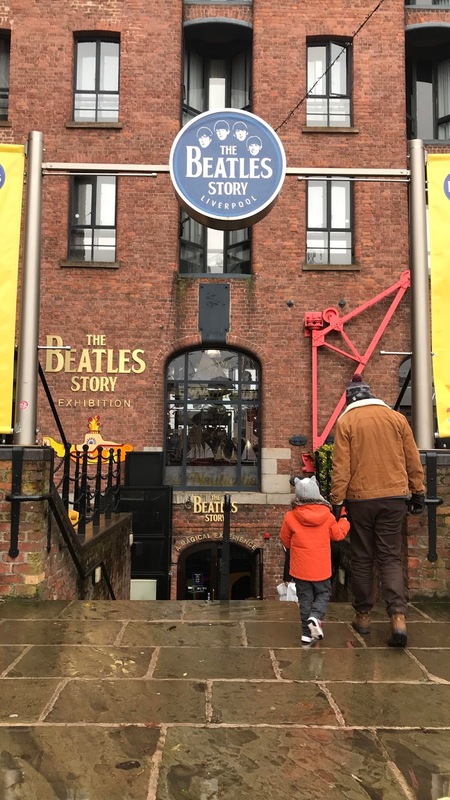 It's a must for any Beatles fan, with a pretty large and impressive gift shop too, and a great stop if you are in Liverpool, particularly if the weather is less than favourable. 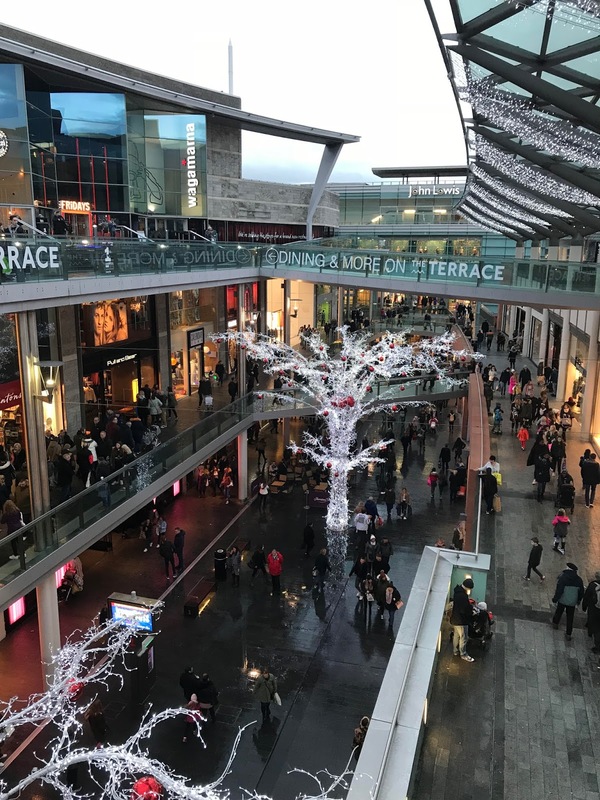 We decided that it was time to look around Liverpool ONE for a spot of Christmas shopping, and there were so many places to visit; all the stores you would expect and a nice centre to walk around, with Christmas lights and decorations up to enjoy and a brass band playing. 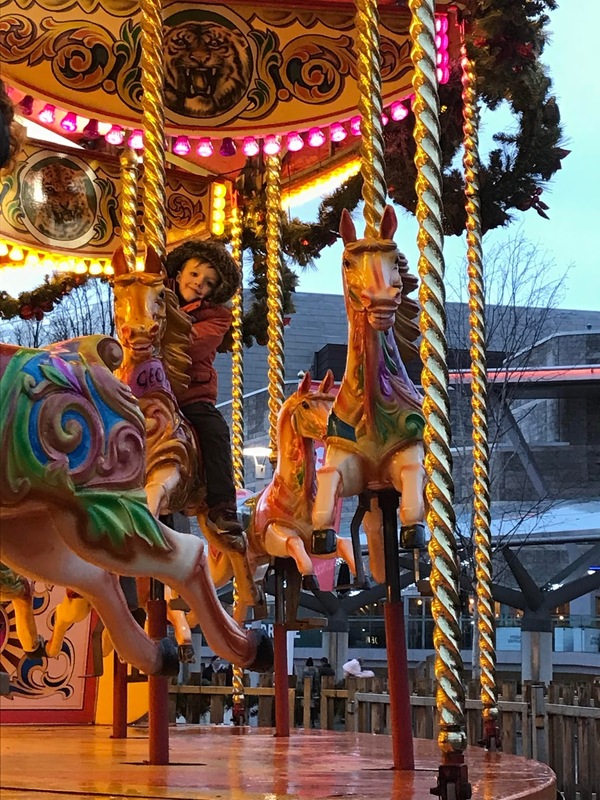 If you head up to the top floor, where the restaurants are, you'll discover the Winter Wonderland and exchanging your coins for tokens, you can enjoy one of the several fairground rides. Ethan and I went on a sleigh ride themed rollercoaster, which he was incredibly excited about, and then he went solo on the carousel. There was a swing ride too and a few others, plus a family photo inside a giant snow glove experience, and by-and-large, each attraction required two to three tokens per person (equalling £2 to £3). There was also a Bavarian themed bar so you can warm up with some mulled wine should you wish. I was determined to track down some Harry Potter items in Primark that I haven't been able to find in Birmngham - and as if by magic, the potions fairy lights and the two house jumpers I was missing were in stock. It was clearly meant to be! 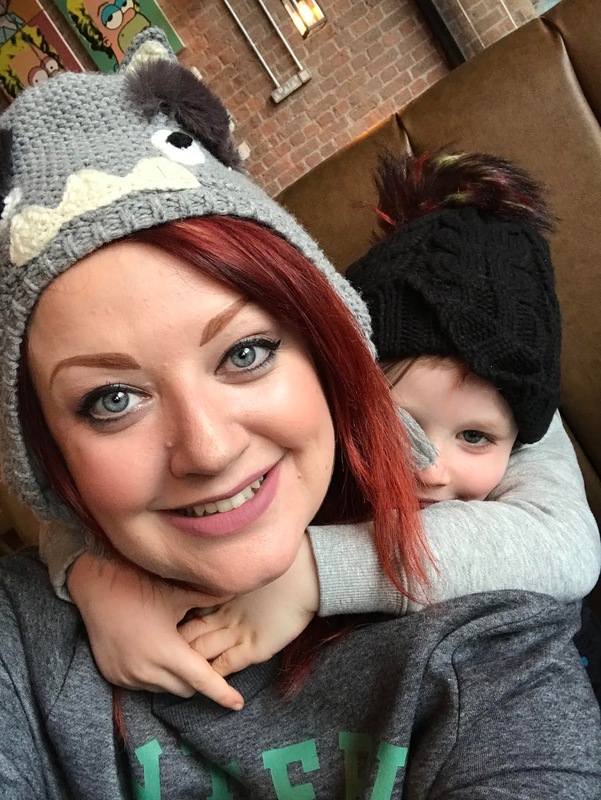 We were due to dine at Viva Brazil, which we were looking forward to as a different kind of meal experience, but Ethan was starting to feel poorly and we'd underestimated how long it would take to do everything on our list too. We decided to leave early evening and it was just as well really, as Ethan nodded off in the car straightaway before taking a turn for the worse that night (he has flu, poor mite, so did amazingly well during our visit not to let on how he was really feeling). We left Liverpool with smiles on our faces, our phones full of photos and some great festive experiences to remember. It is a great city and particularly magical at this time of year, so worth the drive time if you are up to two hours away like us. 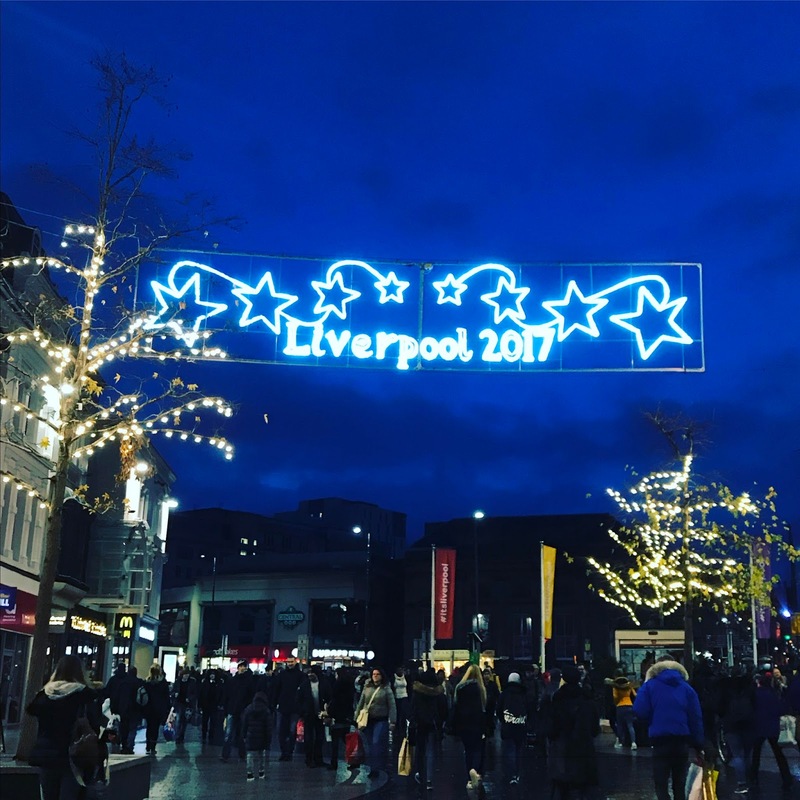 * Thank you to One Magical City for inviting us to enjoy a day out in Liverpool in return for this honest post. View more photos from our day over on my Instagram account. 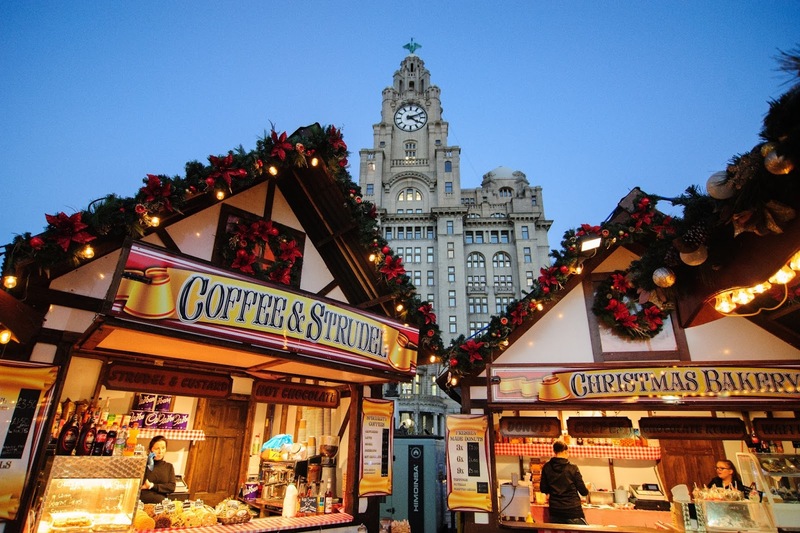 Find out more about the Ice Festival, Albert Dock and Festive Markets in Liverpool this Christmas. Taking pride of place in Paradise Street, the tree, which towers 30ft in the air is the ultimate location for a festive selfie this year. Complete with 280 love hearts that shine different colours, it is a truly unique tree, inspired by the people of Liverpool. Head inside the tree for the exclusive ‘Bar Hütte’ where customers can enjoy a selection of festive alcoholic and non-alcoholic beverages. There are also a range of bookable ‘hüttes’ including disco-themed and ‘carol-oke’ booths, ideal for a last minute Christmas party. Falling Stars will transform the length of Bold Street in an ethereal display of light and sound. A place suspended in time – a reflection of the street’s history but also drawing our gaze upwards to the stars, of what lies beyond. Embracing the linear and aerial perspective of this city centre location, Falling Stars, will present this treasured area in a completely new light. Powerful lasers will shine from the bell tower of St Luke’s onto 8 glistening Stars, suspended along the length of Bold Street, bathing the night sky in colour. Each evening throughout December, the Dock will present a magical light display - captivating visitors and whisking them away on a fantastical journey of storytelling and imagination. 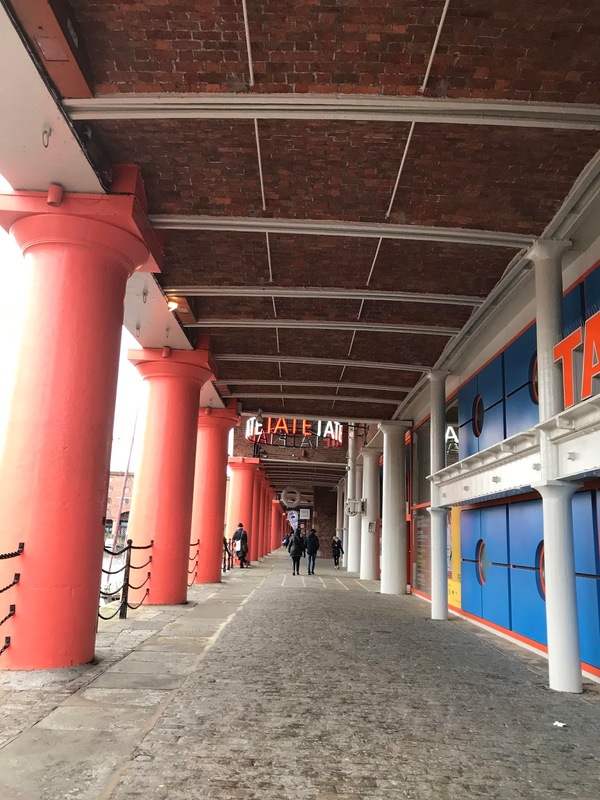 In collaboration with National Museums Liverpool, the iconic Grade I Listed Dr Martin Luther King Jr Building (originally built as the Dock Traffic Office) will become the canvas for an intricate light projection centred around the theme of “Unwrapping Christmas on Albert Dock”, incorporating origami and hand-crafted paper designs in the style of a beautiful pop-up book. 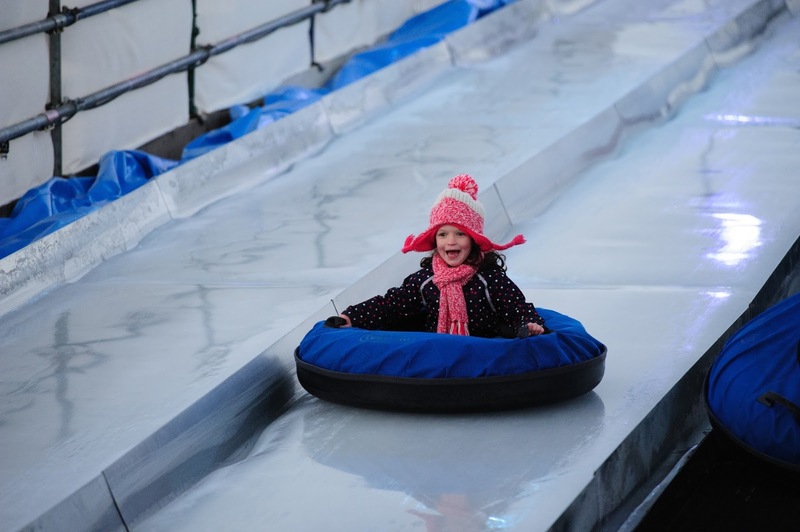 On Chavasse Park, there is plenty for the whole family to enjoy. 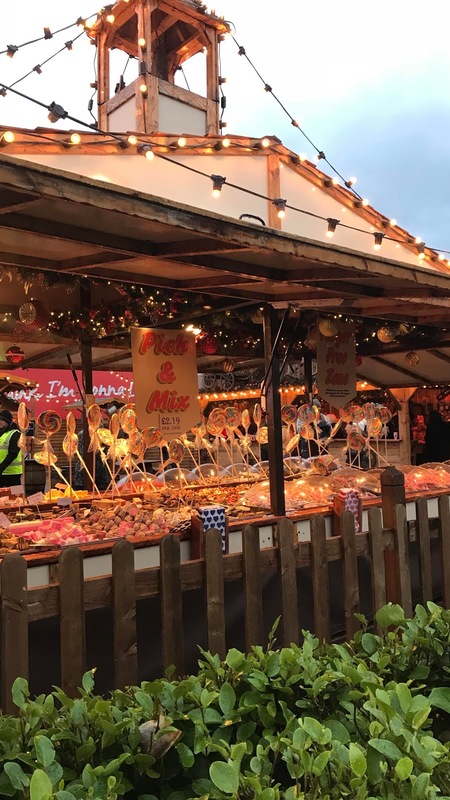 For the youngest visitors, experience traditional fairground rides and attractions – and after a day filled with magical moments, swing by the plentiful food stalls and markets for a festive tipple or bite to eat. Star Cycle is an immersive audio visual installation that will dazzle Castle Street over Christmas. The lights are designed to herald back to Liverpool’s heritage in the 19th century. 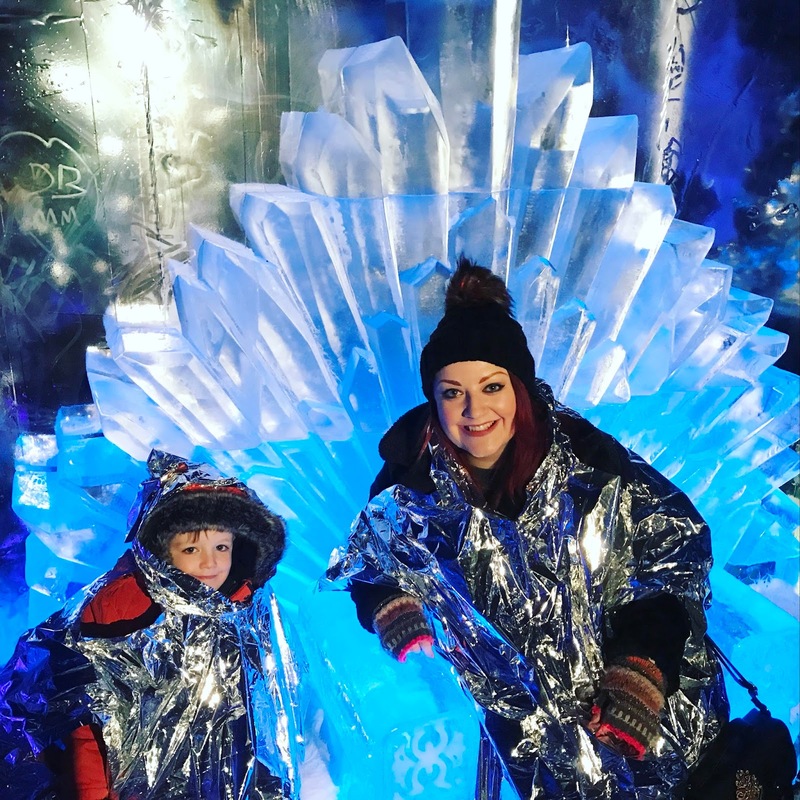 Liverpool Christmas Ice Festival is returning to the Pier Head this winter with a super-sized triple-lane ice slide, larger ice rink, ferris wheel, UK’s only Ice Jet ride, Ice Bar and traditional Christmas market stalls. 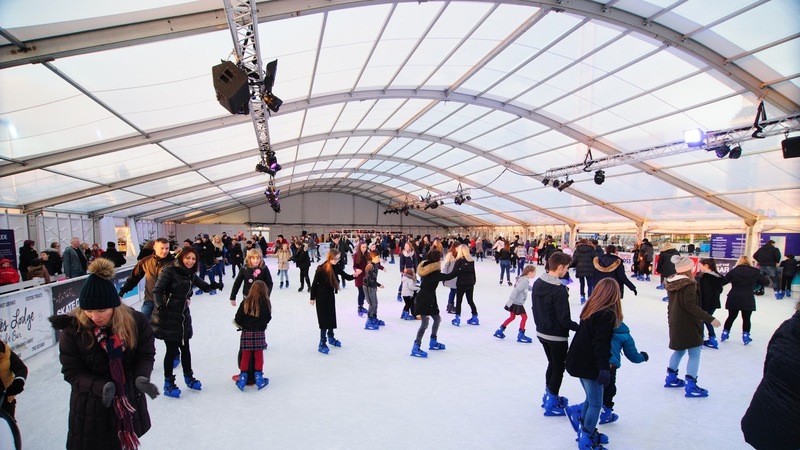 The Ice Festival will also welcome guests from Merseyside and beyond to the iconic waterfront location for mulled wine and hot chocolates in the Après Lounge, and families who will be delighted with the enchanting Santa’s Grotto. Open daily, various times. 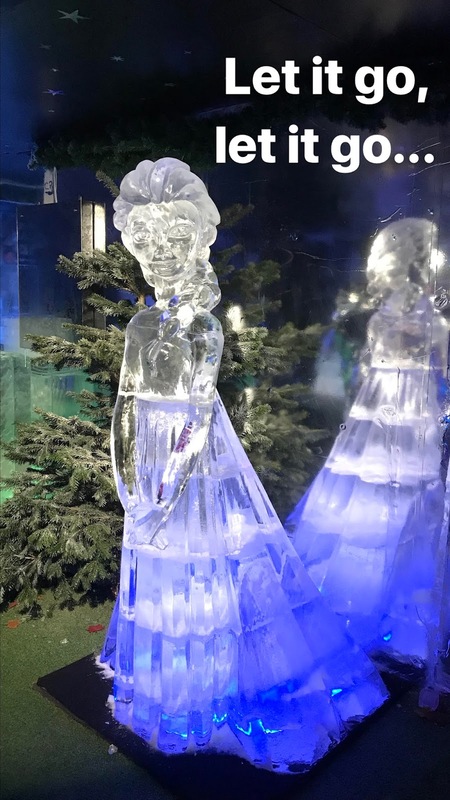 To make a booking, visit the Ice Festival website. The Christmas market is also returning to the plateau for the second year, running from 17 November to 22 December. It will consist of over 40 traditional festive style cabins dressed in garlands and lighting to create a warm festive ambiance. On offer will be a range of hot and cold food and craft stalls.Choose from bratwurst or gourmet burgers, as well as an array of Christmas delights including crepes and cupcakes for those with a sweet tooth. Handmade jewellery, festive decorations, slippers, scarves and edible gifts will also make perfect stocking fillers. New for this year, is a brand new Windmill Bar which will serve traditional beers, mulled wine and other festive drinks. Arts and crafts fans can get in to the Christmas spirit by creating their own winter decorations and accessories in specially designed workshops. 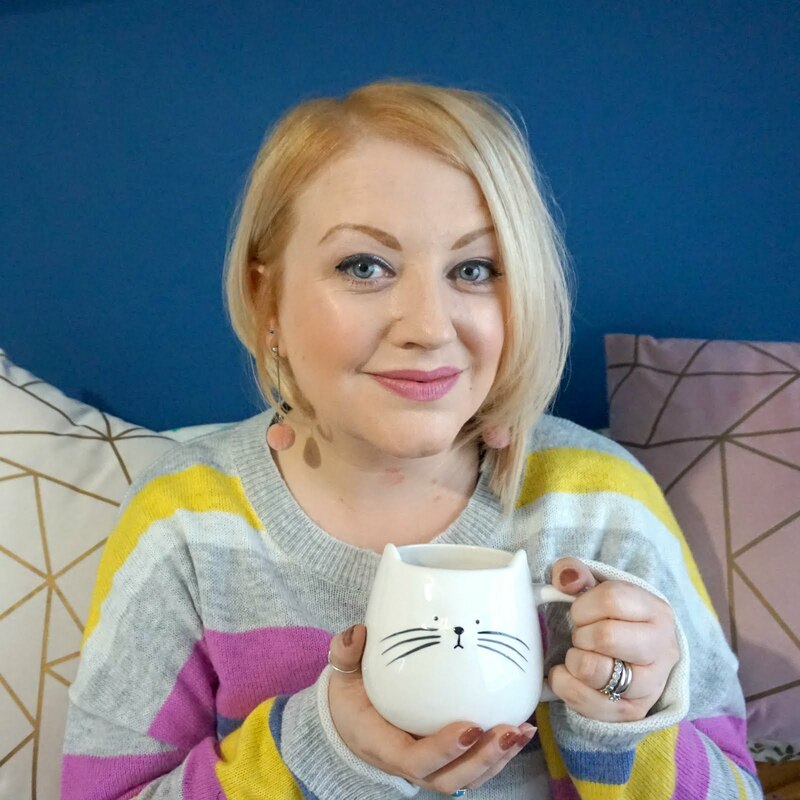 Each workshop is led by an expert that will teach you through the steps to create your design. These include: 16th December - Learn to Make a Silver Ring Workshop (12pm-4pm). Over at St John’s, children can choose from a variety of fun props and pose for a selfie with their resident Elf. There will also be a space where children can write a letter to Santa or just bring along a letter they've written at home to post into their Christmas post box. The workshop activities will change across the Christmas period, from screen-printed cards and letterpress to decoration making and paper crafts. Take ownership of this Christmas and change the colours on our interactive Christmas tree as you wish. 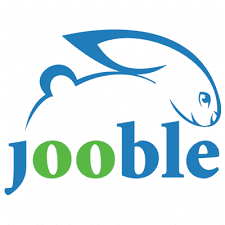 A great entertainment for both families and group of friends. Bathing the Primark building in colour, Celestial Light, will run for six weeks, physically changing and growing, providing a celebration of light and energy. Taking in many forms, patterns and hues, emitting tones, sonic textures and beautiful motifs. The world famous Cairngorm Reindeers are back in Liverpool for a quick stop off before Christmas Eve.